The Santa Lucia Highlands AVA is a narrow, eastward-facing sliver of the Salinas River Valley in Central California. Having just returned from a whirlwind blitz of the area, I'm exhausted, but excited to share what I learned through meeting more than eight winemakers and vineyards managers, and tasting through more than 60 wines. Rest assured, detailed reports describing the area and its wines are forthcoming, but here's a snapshot of the best of what that area has to offer. As it turns out, what follows was the first wine I tasted on arriving in the area - and the one which set an unreachable bar for the entire stay. As tends to happen, this was quite by accident. Spontaneously dropping in at a bar on the outskirts of Salinas, I asked for a glass of whatever the barkeep liked. God bless the barkeep at Zeph's! Holy crap! Positively bursting from the glass with unapologetic energy and fruit, this Pinot sings notes deep and high with equal measures of bravado and intensity. The wine is so fresh, powerful, alluring, and down right excellent, I looked around to be sure someone wasn't playing a trick on me. Undeniably sultry and smooth, this is excitement in a glass. Though not for the meek, even the most ardent lovers of subdued Burgundy would find this difficult to resist. Bravo, bravo, bravo! As also tends to happen, the best wines rarely make out of the region in which they are grown. 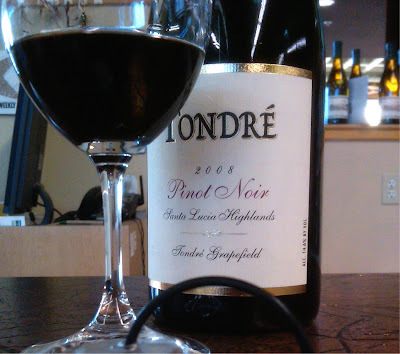 Primarily a growing operation, the Tondre Grapefields supply wineries such as Wrath, David Bruce, Morgan, and others with lovingly raised Pinot Noir. Word is that they make just enough of their own wine to serve as a marketing tool for their grape sales. That said, a quick Google search will let you know how to put your hands on some of this precious juice.